Heating systems usually take a back seat to air conditioning here in the Southland, where winters are short and mild and summers and long and hot. It’s only April and yet chances are you’re done with your heating system until September or October at the very earliest. That can lead some homeowners to neglect their heating system, which can come back to bite you in the fall when temperatures drop. We don’t have to deal with freezing weather the way they do back east, but our winter nights can get pretty chilly, and you need your heating system to provide reliable warmth and comfort for your family. Without periodic care, your furnace will likely run into trouble just when you need it the most: forcing you to make an expensive repair call on short notice. It doesn’t have to be that way. A good maintenance session performed by a trained technician can not only help your heater perform at its best, but can actually reduce the chances of a repair call. Here’s how it works. Servicing sessions essentially give the technician a chance to look the entire system over for signs of trouble, including running the heater for 15-20 minutes and examining it to see if anything’s wrong. In the event of a minor issue, such as clogged burners or a loose fitting, the technician can fix it as part of the servicing session. If a more serious issue is spotted – something requiring a separate repair session to take care of – the technician can schedule it with you immediately. Assuming the proper equipment is on-hand (and in almost every case, it is), you can even schedule to repair session to take place immediately after the maintenance session is completed. Improved Savings and Longevity. By catching those little issues, the servicing session reduces the amount of energy your system wastes. That in turn, will lower the costs of running the system every month, compared to running it without the benefit of a servicing session. That can ease the strain on your monthly budget considerably. When appliance regularly over time, that can also help extend the overall life of your system by months or even years in some cases. Reduced Risk of Repairs. The same principle applies when it comes to future repairs on the heating system. Improved efficiency means lowered strain on individual components, which in turn reduces the chances of suffering a breakdown. An Early Jump on Repairs. In the event further repairs are required, the servicing session allows you to deal with them at your leisure, instead of rushing around in the face of a sudden breakdown. Furthermore, by spotting the need for repairs now, you have the entire summer to plan for them, ensuring that your heating system will be ready to go on the first cold day next fall. 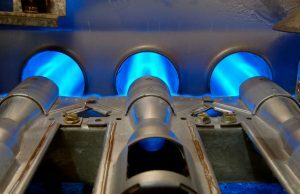 For heating servicing and heating repair in Torrance, CA, call the friendly pros at Greenleaf Heating & Cooling.